Spectrum’s Freedom S.40 provides unprecedented performance with its capability to travel long distances non-stop, utilizing an amazingly small amount of fuel and generating the lowest carbon footprint in its class. This range map depicts missions which Freedom can perform with a pilot plus four passengers, calculated using the NBAA IFR flight profile. 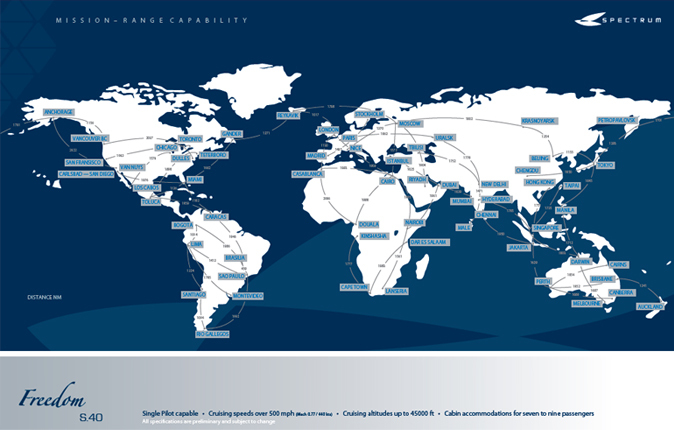 Detailed NBAA mission analysis and City Pair time and fuel usage data is also available by selecting the range map below. We encourage you to visit www.spectrummission.com for an interactive comparison of Freedom and Independence capabilities contrasted with other aircraft.